There’s a very nice non-profit organization I follow on Twitter that retweets the same links over and over. Volunteers tweet in teams and actually seem to think that broadcasting at a rate of more than one tweet per minute for 15 or 20 minutes is a good thing. (Hint: It’s not.) So I moved them off my primary timeline and only check their feed every few days. The way they use Twitter, it’s enough. But they’re not so bad–more like overeager puppies or toddlers learning to speak than machines. The same goes for some of the news sources I follow. I don’t expect the BBC News to interact with me on Twitter (or anywhere else). The reason I follow them is to get notifications about new articles and videos they post to their website. So the Turing Test doesn’t really apply to those accounts. They more or less replicate TV, radio and newspapers in the way they deliver information to me. As long as the information is interesting and useful, I’ll continue to follow them. Three recent examples illustrate how real people can pass or fail a Turing Test. I use Twitter in these examples, but the same can be true of Facebook, LinkedIn or even e-mail. Some Twitter users, both individuals and organizations, send automated Direct Messages (Auto-DMs) to anyone who follows them. The practice is so unpopular with followers that I wonder why it persists. At best it feels impersonal; at worst some of the automated messages are nothing but advertisements for a product, website, etc. In a recent Twitter chat, a few people said that if they receive an Auto-DM they immediately stop following that account. I’ve been thinking about this recently. After almost six months on Twitter I follow over 1,000 accounts and have over 500 followers. I don’t thank people for following me, though I’m glad to follow them in return, engage them in conversation, or simply read what they tweet. It depends on what their profiles and recent tweets suggest about their genuineness and whether I think they would be interesting to follow. As for being thanked by everyone I follow… No! If you feel the need to thank each person who follows you, you’re either very new at Twitter or you need to get a life. Just go on being interesting. I’ll be happy if you follow me back, retweet something I post, or send me a tweet to start a conversation. But “Thank you for following me” is not necessary–and if it looks like an Auto-DM, I’d rather you didn’t do it. Someone I know on Twitter was recently followed by a young man (to judge by what little he revealed of himself) she didn’t know. After a few tweets, she decided she didn’t want to know him. It started innocently enough when he mentioned her by her Twitter handle in a tweet. She wrote back and asked if they knew each other. His reply was something along the lines of “No but I’d like to know you.” (This is never a good sign.) She dropped the conversation, but he tweeted directly to her a few more times. One tweet had a link to a photo. When she called it to our attention, a few of us looked at his Twitter account. He had no followers, didn’t follow anyone, and had no biography. We all blocked his account and reported it for spam. He might be harmless enough, but his knowledge of online etiquette is poor even for a newcomer. I’ve saved the happy story for last. 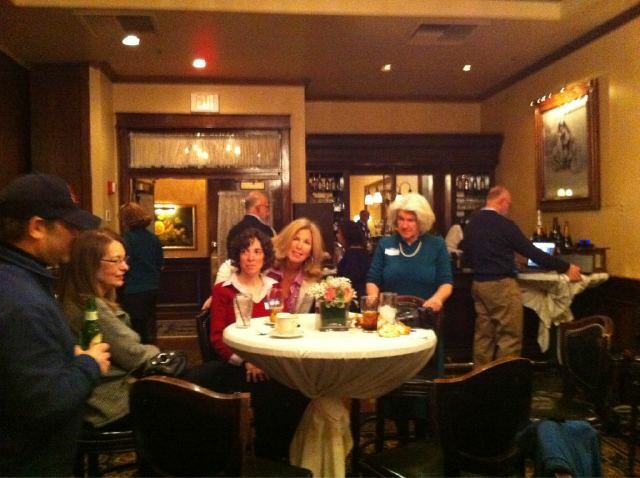 I recently attended a meetup (or tweet-up, if you prefer) with some people I had previously known only through Twitter. We’ve been conversing a lot over the past few months and have become a tribe. As we’re spread all across the United States, Canada and a few other countries, we’ve organized regional meetups; this was not the first, but it was the first that was close enough for me to attend. The good stuff started when I stepped off a train. Another woman had offered to give me a lift from the station to the restaurant where we were meeting. I told her she would probably recognize me by my hair, and sure enough she did. When I saw her waving several yards away on the platform, I recognized her. At the restaurant, an amazing thing happened: one person after another arrived and we recognized each other almost immediately from our profile photos. We talked like old friends. People turned out to be just what we expected in real life. I needed to leave on time to catch my train home. I was sorry to leave so soon and hugs were exchanged. Later I learned that the party had continued after our private room reservation was over. (Yes, I’m a little jealous–but I’m also very happy that we get along as well in real life as on Twitter.) Alan Turing would surely agree that we passed with flying colors. Be yourself online. Don’t try to be someone else, but do remember to be your best self. You’re very visible (unlike the original technology Turing imagined) and you don’t want to make a bad first impression. Share information about yourself. While it’s wise not to reveal too much, people want to know your name, where you live (at least approximately), and what you’re interested in. Use a profile photo or, at minimum, a cartoon sketch or illustration that tells people about you. Fill out your profile and provide link(s) to a blog, website or other profile you have online. Remember that online interactions take place without body language, facial expression, etc. It’s easier to misinterpret words, especially with people who don’t yet know you or your sense of humor. Avoid coming across as rude, snarky or even mean-spirited. Don’t talk like a machine. Real people have many interests in life. If all you post is links to your website or blog, updates about the same topic, or (gasp!) advertising, you’ll bore people. It’s OK to share information about yourself, but mix in other things and share with the people you interact with online. Remember that there are other human beings viewing what you post. Be nice.